20’ x 35’ 3 sided enclosed netted booth. Targets are on a moving belt inside a trailer. 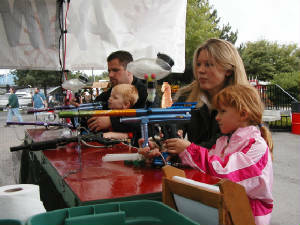 4 paintball markers are secured to the top of a 4’ high counter by a chain in front, and with steel braided CO2 lines running from the back of the markers to large CO2 tanks under the counter. 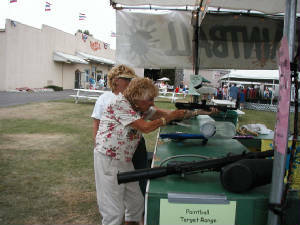 The customer shoots at the moving targets which fall down when hit and stand back up again as they go around. 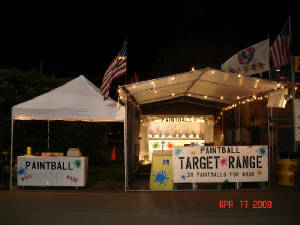 This system was designed and built specifically for paintball. A counter attendant is present at all times for safety. 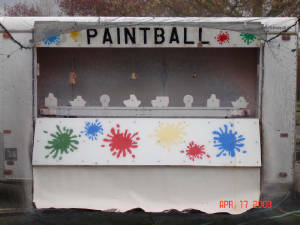 The shell and the liquid from the paintballs, which is food grade gelatin, is contained inside the trailer and drained away by a hose. This product is non-toxic, non-caustic and approved by the EPA.